Handwriting has been central to our lives for thousands of years. The rising popularity of pen-enabled digital devices proves it’s still the easiest, fastest way to document and share ideas and identities. So, how are you going to harness it? There are countless reasons why we turn to handwritten methods to draft, refine, and complete important tasks. Want to give your audience this ability write, draw, sketch and doodle in digital ink? 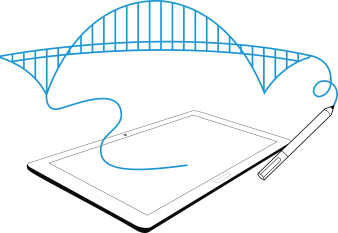 Join the Wacom Inkathon to build new or existing apps that unlock digital ink for your users. Wacom is calling on developers, designers and all other hackers to build great apps that enable digital ink for their users. Natural writing & sketching – high-performance writing/sketching that converts to digital ink data allowing for exchange and collaboration. Exchanging ink – Ink needs to be able to travel from device to device, so WILL™ makes your ink editable across apps, software and services through a common ink data format. Enhanced meaning through metadata – With WILL™, your app can determine that a document containing the word 'WILL' is either a description of the Wacom Ink Layer Language technology, an article about the actor Will Smith, or a legal testament. Cross-realities – WILL™ can also be used for 3D inking applications in augmented and virtual reality environments. The relative depth of different pen strokes made within an AR or VR environment is displayed as they are created. Now, for instance AR 3D ink strokes can also be recorded and saved as a video file for sharing with others via multiple communication channels. Handwritten material expresses meaning that cannot be conveyed with rigid inputs from common everyday programs and applications. Wacom offers a dynamic developer solution, the WILL SDK, to free our yearning to scribble, draw, trace, doodle and draft. The SDK will allow your application to store, process and render pen data that is entered by your users. User pen strokes capture metadata that is valuable to users and developers alike. Attendees at the Wacom Inkathon can expect expert support from the Wacom team to help you figure out how to best leverage WILL™ in your applications. • An algorithm that creates a beautiful visual representation of ink, which motivates people to use it. an unlimited number of use cases. 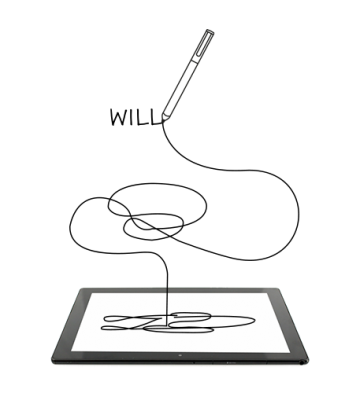 stylus or touch-enabled device, on any platform. Teams that utilize the Microsoft AI API have the chance to win up to 5k in bonus prize monies from the Microsoft team. For a view into what’s currently available for digital inking in Windows, check out these two videos. Also, be sure to check out the Microsoft Build conference (May 6-8) to see what’s coming next. Microsoft will be on the ground to help you build the best Inkathon app possible. Last but not least, Wacom is a founder member of the Digital Stationery Consortium (DSC). Founded in 2016 with other global leaders including Montblanc and Samsung, it’s a non-profit organization that promotes a WILL™-based digital ink framework beyond operating system and ecosystem boundaries. The DSC’s objective is to define a standard for digital ink based on WILL™ and to develop a new digital stationery market that will add value for members and their customers. Ultimately, DSC members want to create a foundation for everyone to collaborate freely around digital ink applications, so that everyone benefits. As a result of the organization’s activities, developers will be better able to expand their creative ideas into valuable products which can be bought in every app store, regardless of platform. The DSC is now accepting Startup and Academic Promoter member applications for a free, one-year, membership. Join our community partners at what we promise will be an awesome Inkathon.